Speaking the truth of Jihad Terror is not Islamophobia ! How can you protect yourself from Violent Jihad ? What is the Freedom From Jihad Course ? 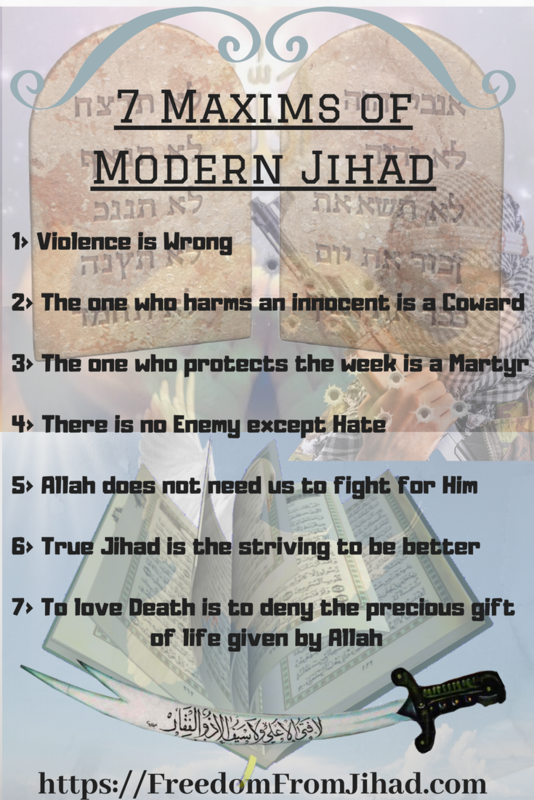 The 'Freedom from Jihad' Course shows how to convert Fear to Love, how to move from Greed to Gratitude and How we can be Free from the tyrany of Jihad. This course exposes the reasons why good people get trapped into the ideology of violent Jihad and why this is wrong. In addition to clarifying the misinterpretations of the Quran that support Jihad, this Course shows how we can rely on the speaking Quran within our Hearts, that knows that violence is wrong. This Course consists of several ebooks, delivered by email, leading the reader step by step towards freedom by means of sequential followup emails. You may opt-out at any time if you do not wish to continue the course. Whether you are a Muslim or a Non Muslim, this Course will empower you to deal with the problem of Jihad faced by both Muslims and Non Muslims in different ways. When I was still a teenager, I was forced by my father to commit a murder in the name of Allah. I have written a detailed account of this horrifying experience in the first chapter of my Freedom from Jihad eBook that you can Enroll for by using the "Get Certificate" Button. As I mature further into the final phase of my life, I am inspired to share my freedom with others, to do my part in rescuing humanity from the grip of violent Jihad. That is the reason I have made this course that you can join on the next page. Lets figure out how to defeat "Radical Islamic Terrorism"
P.S. This information has never been revealed before, Some Radical Muslims may not like it, but the truth has to be told to stop violence in the name of Islam. P.P.S. Be a part of the solution by learning about the true face of Islam, we cannot afford to postpone this critical moment any longer, Click on Answer 3 Questions to Enroll now.